Well at least in MY art shack! I am loving that there are warmer and sunnier days popping up more often. 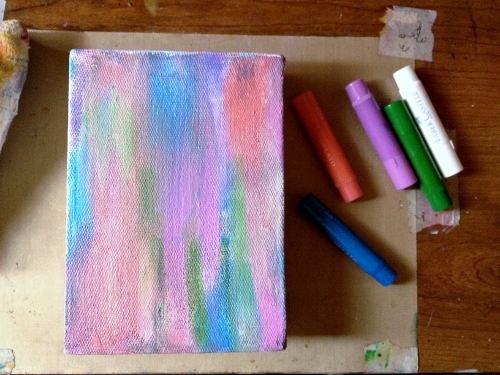 It has put me in the mood for vibrant colors and fresh new starts. I am so energized by sunshine. After the shorter and darker days of winter I love the renewal spring brings in nature and in my spirit as well. 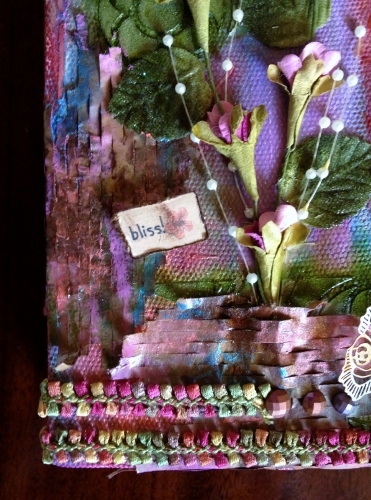 Recently I created a mixed media canvas. The first one I’ve ever done completely on my own. 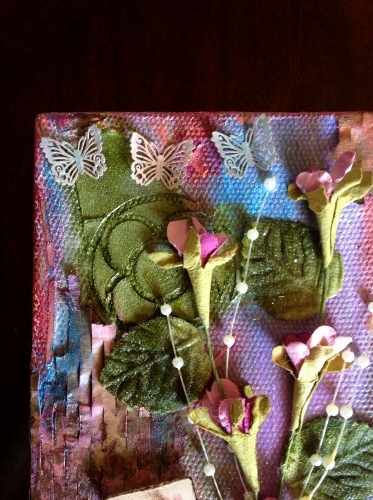 I created one other mixed media canvas a couple of years ago at an art retreat class I attended, but that one was under the guidance and supervision of a wonderful and talented instructor (Kim Geiser of Persimmons Studio). This time I was under the influence of only myself and my sunshine energized spirit…. and, well, some chocolate. Rich, creamy dark chocolate….but I digress–back to the story of my canvas. A few months ago I was introduced to the Faber-Castell Gelatos by the Swirlydoos Kit Club (swirlydoos.com). I’d heard of gelatos and actually even had one in my possession from a gift bag I’d received at an art retreat, but I’d never actually tried it out. I received several gelatos in the kit from Swirlydoos and I’d had a chance to experiment with them and had fallen in love with them. Gelatos are water-soluble creamy crayon-type yummy goodness that come in many colors–many rich, vibrant, and very tempting colors. 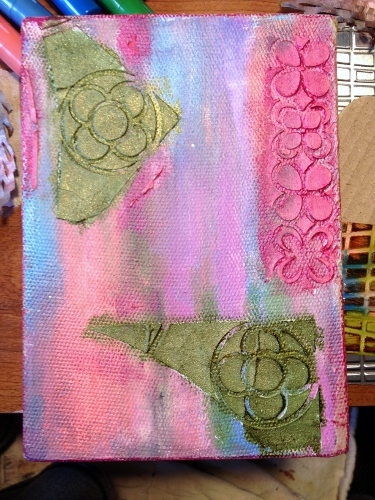 I knew I wanted to use gelatos to make a background for whatever I was going to do on my small (half-off clearance bin) canvas and I knew I wanted to use a particular flower stem that I had in my stash–again from Swirlydoos–so I set about working on my canvas. 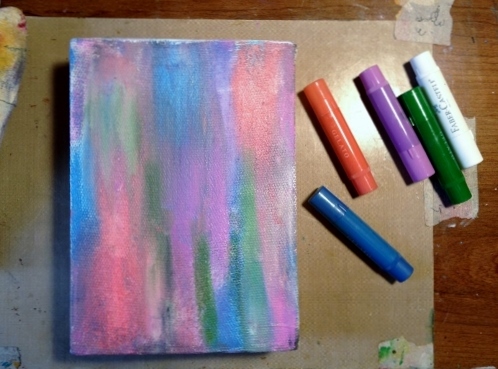 I primed my canvas with white gesso and used a combination of coloring and spritzing with water and blended with a brush. I had no firm plan so I kept experimenting with the water and combining the different gelato colors and was finally satisfied with my background. I liked that the elements of the stencils I chose were of similar size and had a similar pattern. 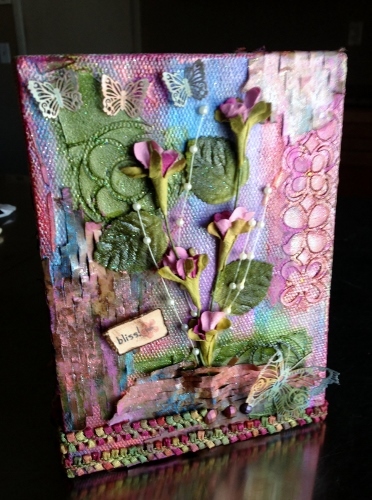 Once I finished my background setup I wanted to incorporate my flower stem inspiration piece, some textured packing material, and some delicate butterflies I had previously misted. Over the next few days I worked on my canvas off and on in between other projects. I arranged, I rearranged. I added, I subtracted. 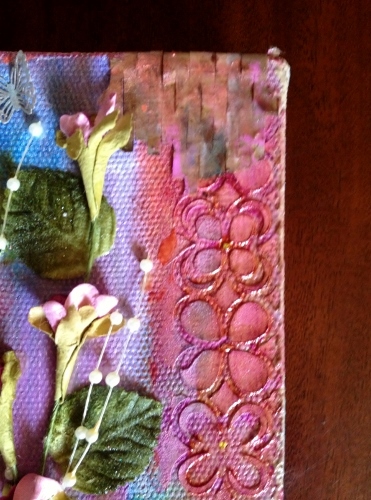 I adhered my flower inspiration but I just couldn’t decide WHAT NEXT??? So I did what I often do when I’m troubled by anything a major dilemma—retail therapy. Art supply retail therapy. During the course of my “therapy” I found some really gorgeous and so so so beautiful trims in the color palette I was using on this project. It was the inspiration I needed and my project FLOWED! I added my packing material. and it was finished. TFL!